The Epson Home Cinema 5040UB is a stunning value in today's market with its recent drop to $2,699. Built around three 1080p LCD chips and Epson's 4K-Enhancement pixel-shifting technology, its image looks a lot closer to true 4K than 1080p. Compared with standard 1080p models like the Sony HW45ES and the Epson Home Cinema 3900, it offers visibly superior resolution and image quality for not a lot more money, as well as compatibility with all of the new 4K video content coming onto the market. And when compared with current native 4K projectors, it delivers nearly as high quality an image at a far lower price. That puts it in a sweet spot virtually by itself at this writing. Beyond its 4K advantage, the 5040UB has other features that by themselves justify most of the difference in price between it and conventional 1080p models. At the top of the list is the all-glass, 16-piece 2.1x zoom lens that is designed for 4K performance. The lens system has motorized zoom, lens shift, and focus, with a lens shift range that no other projector exceeds. And conveniently, the powered Lens Memory feature lets you save 10 lens positions and adjust all three settings with a single command for Constant Image Height (CIH) operation with a Cinemascope 2.4:1 screen without the bother or cost of an anamorphic lens. The 5040UB boasts HDR-compatibility as well as the ability to display the entire sRGB and DCI color spaces. And when it comes to lumen power the 5040UB delivers more than it promises. 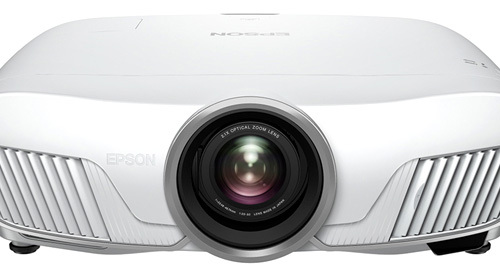 Epson rates it at 2,500 lumens for both white and color brightness. But that is pretty much what it gives you in Video Optimized calibration. In its brightest mode we measured it at roughly 3,500 lumens, which makes it suitable for an even wider range of lighting conditions. The high brightness will let it stand up to ambient light, while the HDR support is best reserved for dark theater viewing. In addition to running our usual tests for this review, we did side-by-side comparisons of the 5040UB with the Epson 3900 and Sony HW45ES, two highly capable 1080p models priced about $700 below the 5040UB. The results are discussed in detail in the Epson 3900 review and the Sony HW45ES review. The conclusion, however, is that the 5040UB is in a wholly different league, with wider color gamut and more refined color, deeper blacks, noticeably higher contrast, and a sharper, more detailed image even before turning on 4K enhancement. That's worth underlining. A lot of what makes the 5040UB's image stand out has nothing to do with the 4K enhancement or the HDR support. It comes from the basic fundamentals of rich color, deep blacks, and obviously high contrast that adds a sense of three-dimensionality. The color accuracy is good enough in almost every predefined color mode so you wouldn't know if it's technically off at all without measurements or at least comparing it to something you know is properly calibrated. The exceptions are Dynamic mode, which has the usual slight green bias most projectors have in their brightest color modes, and B&W Cinema mode, which is designed to give you a warmer 5500 degree color temperature to mimic the original appearance of B&W film in a 1940's movie theater. The sense of extra sharpness with plain vanilla 1080p comes partly from the high contrast ratio and partly from sophisticated video processing features, like Epson's Super Resolution. At its default setting, it works nicely, along with the defaults for sharpness and detail enhancement, to make the image a little crisper. Also adding to the sharpness and detail is the high quality, 16-piece glass lens. By virtue of being designed to hold the higher level of detail the 4K-enhancement feature delivers, it also holds detail better even with 4K Enhancement turned off. 4K Enhancement. The key to understanding why the 4K Enhancement looks so impressive is realizing that there's only so much detail the human eye can actually resolve. The 5040UB's pixel-shifting technology increases the apparent resolution of the picture by enough to come close to that limit. Of course it depends on how close you like to sit to the screen. And it also depends on the type of subject matter -- it is easier to see resolution differences between the 5040UB and native 4K projectors when viewing high resolution graphics and text documents than it is with video. Depending on the input signal, some menu options aren't available. Using a 4K input signal, Frame Interpolation (FI) and the noise reduction features are not available. With 1080p input, you can choose either one without the other, or turn off both. Since you can't have 4K enhancement and FI at the same time, you may never use FI, which a lot of people don't like anyway because of the digital video effect. If you use it, you can choose between Low, Medium, and High. The Low setting delivers a slight smoothing of motion artifacts with hardly any digital video effect. Medium increases both, and High increases them even more, which makes the two highest settings best reserved for live or recorded video. 3D Video. The 5040UB's 3D support is limited to 1080p and RF glasses. Image quality is similar to 1080p 2D for image characteristics that both 2D and 3D share. Beyond that, I didn't see any 3D-related motion artifacts in most clips that tend to show them and only a hint of them in the few where they did show. I also saw some exceedingly minor crosstalk in one clip where it tends to show, but nowhere near enough to consider bothersome. Brightness is necessarily lower than in any of the 2D modes, but you have a choice of both a 3D Cinema mode with a typical drop in brightness and a somewhat brighter 3D Dynamic mode. HDR. Projectors have inherent limitations for HDR, including the fact that ambient light will wash out darker shades on screen and most of the benefit of HDR along with it. Within that context, however, the 5040UB does a credible job. For testing HDR, I used a Samsung UBD-K8500 player and a Batman v Superman 4K HDR disc. The 5040UB's four HDR modes all darken the average image brightness overall compared with SDR mode, with HDR 1 being the brightest and HDR 4 the darkest. HDR 1 is the default for HDR input, since Epson feels that most people will find it the best compromise between overall brightness vs. color accuracy and shadow detail. Be aware that the 5040UB doesn't change any other settings when it switches to HDR mode. You need to adjust Brightness and Contrast separately for HDR, save the settings to memory, and then manually load them for HDR input. When it comes to HDR the right settings make all the difference between a compelling picture and an almost unwatchable one. Very interesting review and impressive projector for the price. I am considering replacing my Panasonic AE4000u with the Epson 5040UB as a result of the great reviews it's gotten and the higher lumen output, not to mention the 4K Enhancement technology. It would have been of additional interest to comment on the 5040UB's black levels and how good/bad they are compared to other projectors, especially since based on your tests the 5040UB seems to put out higher lumens than is actually stated in its specs. Otherwise, I am looking forward to purchasing this projector real soon. Had I not owned a JVC I would have thought the Epson blacks were superb. They're not as good as the best of the best, but they're very good and quite acceptable. I am confused by the comments here and elsewhere on this site regarding fan noise being not noticeable. I don't know if I have a bad fan or I'm just more critical but mine is very noticeable even in eco mode. It also seems to wander so the pitch changes making it harder to get used to. Appreciate hearing comments from anyone else owning this projector. I have read a lot of reviews stating the projector is great, but the power is consistently failing. The units suddenly refuse to come on at all. Are you aware of this issue, and do you know if it's been fixed? I was ready to buy but now am hesitant. Thanks! Tyler, I'm aware of this issue and recently reached out to Epson about it. The same issue applied to what appears to be a smaller number of HC 4000 samples as well, if you read the reviews on Amazon. Epson's official response to my query is below. One thing I would add is that, given that Epson had a significant number of product failures on this chassis that they had to deal with after the fact, we can probably feel confident that the new updated models built on the same chassis -- the HC 4010 and the successor to the HC 5040 that is currently expected soon -- will not suffer the same issues. Yeah...I’m going onto my third replacement, warranty ends in 2 months for the 5040ub. Wish I kept my 5030 as the one I bought is still running strong and like new and never have needed a replacement.